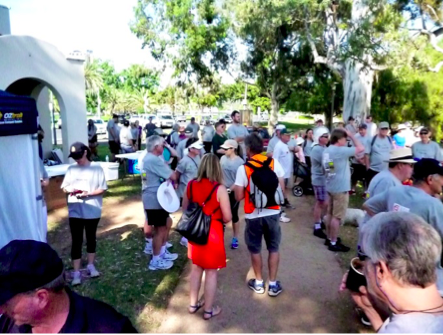 A beautiful day greeted the 200 plus dogs crowd which gathered on the banks of the Torrens Lake on 25 Oct to take part in the Veterans’ Support Walk. This year the day was organised by Reuben Vanderzalm from Adelaide Exercise Physiology assisted by some of his staff and a few other volunteers. Thanks Reuben and company. After parking of the parade ground the crowd waited patiently for the start while listening to some interesting and funny commentary from Peter Goers. A number of serious runners were among those gathered, looking for a share of the cash prizes on offer. The Veterans Rowing Club catered for those with a need for a morning coffee while the MFS through David Gorham worked frantically to set up the BBQ which happened to coincide with an emergency response in the city. And a close thing it was too with the first batch of snags rolling off the barby as the quickest groups completed the 5km course. 1st Team Steve, Lindi and Mike and the random $50 winners were Jeanette Mossop (who handed her winning back), and Wendy Turner. A number of raffle winners also departed smiling. The day will clear in excess of $14.5K which is a great effort. Thanks to all those who gave support to the day.